Putting around at Chuckster’s Family Fun Park. CHICHESTER, N.H. — Every sport has its ultimate challenge. For runners, it’s the Boston Marathon. For mountain climbers, there’s Mount Everest. Professional golfers have St Andrews Links in Scotland. 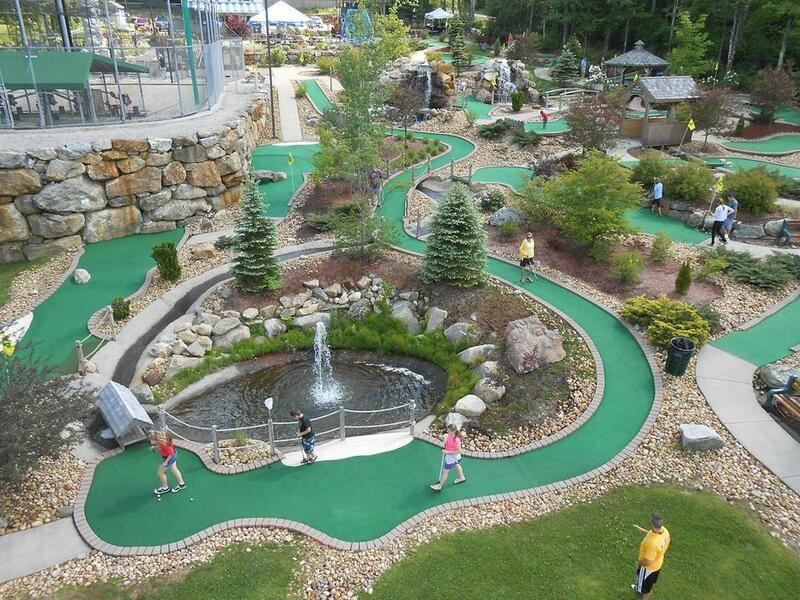 For miniature golf aficionados, it’s Chuckster’s Family Fun Park, a modest amusement facility on Route 4 in this small town, just minutes from Concord. Chuckster’s is where you will find the longest miniature golf hole in the world. No. 13 is a par 3 that is more than 200 feet long and doglegs sharply to the right. But, amazingly, its distance is only part of its challenge: the “fairway” includes water traps, “roughs,” and the very real chance that your ball will get caught in a water hazard that carries it down a small stream and under a tiny wooden covered bridge before it gets dropped back onto the green. Perhaps most significantly, the 201-foot hole sits on a slope. Mark Blasko, the creator and owner of Chuckster’s, says that he found inspiration for his New England landmark in a flash. What began as a relaxing evening at the Hilltop Fun Center in Somersworth became a turning point after his two children, then ages 4 and 6, teed off at a miniature golf hole on top of a slight incline. As soon as their balls began rolling, the children took out after them. At the time, it turned out to be at a place called the Rocky Gorge 4 Seasons Golf Fairway in Laurel, Md. A hole there measured 184 feet long. The local entrepreneur never intended Chuckster’s to become a focus of interest among mini golf fans. A former ski industry employee — he worked at the Gunstock Mountain Resort in Gilford, N.H., and at Waterville Valley — he owned a custom casual clothing business near the current Chuckster’s site before he began thinking about a miniature golf course in the Concord area. And even then, it was only with the idea of creating a profitable ancillary business. “I was sold on Route 4 because I was always struck by the traffic on it — especially every time I was coming home and had to turn left onto it,” Blasko said. “And there are not many highways leading out or into Concord where there’s still land available. “Then one day, I was coming home and saw the sign that this property was for sale. So I pulled over,” he recalled. The 13th hole at Chuckster’s Family Fun Park is a par 3 that is more than 200 feet long. To bring his vision to life, Blasko began visiting other mini golf courses. 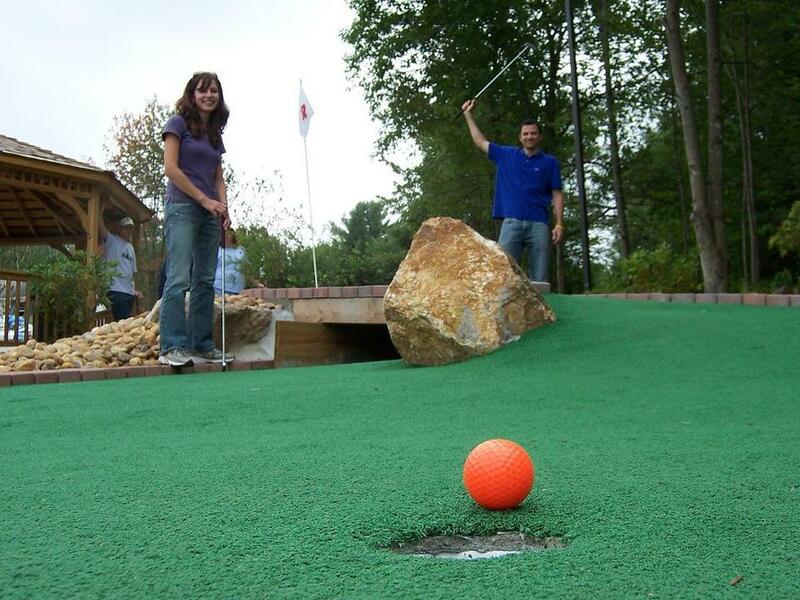 He soon discovered that miniature golf is huge in the United States; a 2006 survey reported that one-quarter of Americans play at least once a year. “But they’re usually pretty easy courses that are designed to get as many people as you can in and out quickly,” Blasko said. He knew he needed to do something different to draw people back on a regular basis, so he went to work with Harris Miniature Golf Co. of Wildwood, N.J., which had built more than 800 courses. He liked their materials and the look and feel of their courses, but they were doubtful about his idea of creating a genuinely challenging course — eschewing windmills and inane themes (including the dinosaurs and space ships currently popular in resort towns) — in favor of slopes, hills, dips, faux sand traps, covered wooden bridges, and fountains and flowing water throughout. But before they were done, Chuckster’s was built on 13 acres of land — nearly twice the size of most miniature golf courses — incorporating a thousand tons of boulders originally located on the property with nine streams and ponds, hundreds of plants and trees, and about 12,000 square feet of “carpeting” — again, about twice what most miniature golf courses have. Chuckster’s opened nine years ago and is open into October. A full schedule can be found online at www.chuckstersnh.com. A round of mini golf costs $8.50. The fee for ages 5 and under is $5. Ray Carbone can be reached at raycarbone@yahoo.com.